Ministers are expected to debate how many doctors should be involved in deciding whether a procedure can go ahead. 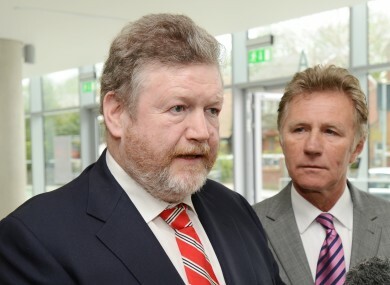 James Reilly says draft abortion laws will not require women to go before six doctors, as was reported at the weekend. GOVERNMENT MINISTERS will this morning hold their first discussions on the contents of draft legislation which will legally permit abortion in certain circumstances. The legislation, being brought forward by health minister James Reilly, follows the European Court of Human Rights’ ruling in 2010 in the A, B and C case – where it was ruled that Ireland’s failure to clarify the circumstances in which an abortion could be carried out. A key point of debate for ministers will be discussing exactly how many medical professionals will be involved in deciding when an abortion can be permitted. It was reported on Sunday that one draft of the legislation would require pregnant women to be assessed by six medical professionals, including two obstetricians and four psychiatrists, including one perinatal psychiatrist – plans which prompted ire from some, who said the prospect of a six-member panel. However, Reilly said yesterday that the legislation would not require six professionals to be consulted. The report of the Expert Group formed to respond to the A, B and C case had suggested a panel of three professionals. Though the matter is expected to be up for discussion when ministers hold their weekly Cabinet meeting this morning, it is not clear whether ministers expect to reach a conclusion on the matter. Justice minister Alan Shatter, who will miss today’s meeting to chair a meeting of EU defence ministers in Luxembourg, told RTÉ’s Morning Ireland it was important that the legislation did not raise “unreal barriers” stopping women from accessing life-saving treatment if it was needed. “It is important that we have a legal architecture in place so that women understand what the position is, and what assistance is available to them, and so no confusion arises between members of the medical profession,” he said. Shatter added that the government’s timetable of having the legislation in place by the summer recess – when the Dáil breaks for the summer in mid-July – was still “readily achievable”. Email “Cabinet to discuss draft contents of controversial abortion bill”. Feedback on “Cabinet to discuss draft contents of controversial abortion bill”.